The Dana-Farber Cancer Institute’s ultimate goal is the eradication of cancer, AIDS, and related diseases and the fear that they engender. Dana-Farber was founded in 1947. The mission of the Dana-Farber Cancer Institute is to provide expert, compassionate care to children and adults with cancer while advancing the understanding, diagnosis, treatment, cure, and prevention of cancer and related diseases. As an affiliate of Harvard Medical School and a Comprehensive Cancer Center designated by the National Cancer Institute, the Institute also provides training for new generations of physicians and scientists, designs programs that promote public health particularly among high-risk and underserved populations, and disseminates innovative patient therapies and scientific discoveries to our target community across the United States and throughout the world. 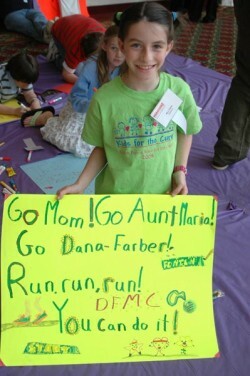 Participants in the Dana-Farber Marathon Challenge raise millions for cancer research every year at the Boston Marathon. Since that first pasta dinner in 1998, Uta has been fortunate to get more involved with Dana-Farber. She speaks to the marathon runners the night before Boston, visits children in the hospital, is in contact with cancer patients and is involved with fundraising. As an example of her work with Dana-Farber, below is the text of a talk Uta gave to a gathering of children suffering from cancer in Boston on April 18, 2004, on the eve of the 108th Boston Marathon. “Thank you for the lovely invitation to your pasta party once again on the eve of the 108th edition of the Boston Marathon. I hope you are having a great time tonight, have done some carbo-loading and most of all I hope you runners are not too nervous about tomorrow’s race. Let me wish you good luck with a little story. I did not make any notes for this speech, because this comes straight from my heart. I am so lucky to have a very special little friend – well, she is taller than me, but much younger, just 14 years old. She has beautiful long dark hair, the biggest and loveliest brown eyes I’ve ever seen, and the kindest of hearts. Last year I saw her several times and each time her hair had grown a little longer. This made me curious so I asked her why she was growing her hair almost down to her hips? Her eyes grew wide as she asked me if I had ever heard of “Locks for Love.” I replied “No, what does it mean, little one?” She explained that children would grow their hair very long and then get it cut to make a wig for other children who might need it. It’s a nationwide program to support and help kids who have cancer. I was so happy to hear about it and got excited myself and asked her, “How long do you have to let it grow so you can make a wig out of it?” She told me that her hair needed to be at least 10 inches, but she would grow it a little longer so that even the ends of her hair, which sometimes got a little damaged and dry, would be perfect and look good. Then I remembered some of you kids, strong, never giving up, always smiling when I was allowed to visit you in the hospital. And I promise, we will always support you! My deepest admiration goes out to you and your parents, your running partners, the physicians and nurses, scientists and supporters and sponsors for the Dana-Farber cancer research program. Thank you for your endless love and care for the children. And runners, good luck for tomorrow’s race! You might have to cover your hair with a light colored running cap to stay cool, as the weather forecast predicts hot temperatures and sunshine. We will be with you all through the 26.2 miles.